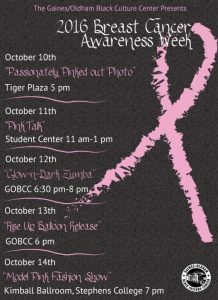 In an effort to support those affected by breast cancer, the Gaines/Oldham Black Culture Center & various student organizations will be hosting the 2nd Annual Breast Cancer Awareness Week. According to the National Cancer Institute, breast cancer is the second most common cancer in women in the United States. Additionally, each year there are about 2,300 new cases of breast cancer in men and about 230,000 new cases in women. Due to breast cancer’s impact on us all, Breast Cancer Awareness Week 2016 will include a number of philanthropic events and initiatives hosted by campus and community organizations purposed to contribute to the fight against breast cancer.